The latest 60s instrumental compilation from the Pipeline boys: with half of the 26 tracks previously unreleased this is a must-have for all instrumental fans. 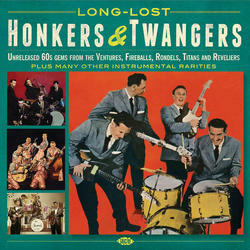 Features five unissued titles by the Ventures, including the original demo for 'Walk Don't Run', plus two hitherto unknown performances by Ventures' guitarist Gerry McGee. There are previously unheard rockin' instrumentals by the Fireballs, the Rondels, the Titans and the Reveliers and rarities from Johnny & The Hurricanes, the Champs, the Ramrods plus more. The cult classic 'Ghost Train' by the Swanks is from the original master tape as an added bonus.